If you’ve hiked up the main trail in the Rattlesnake Recreation Area, you’ve noticed the fenced off area just downstream from the “horse bridge”. Last year RCWG joined forces with the Lolo N.F. to plant trees and shrubs within that fenced off area where the streambank was rebuilt. The broadleaved shrubs (wild rose, willow, dogwood, etc.) that we planted last year all seem pretty well established, but sadly, the ponderosa pine seedlings experienced frost damage and mostly died off during the year. So last week we went back up with some fresh young trees to try again. These little pines will need some extra watering to make it through the coming summer. If you’re hiking by and notice that they look dry, please drop us a line and we’ll send someone out. Better yet, you can join us as a volunteer–we’ve got some watering cans stashed nearby. 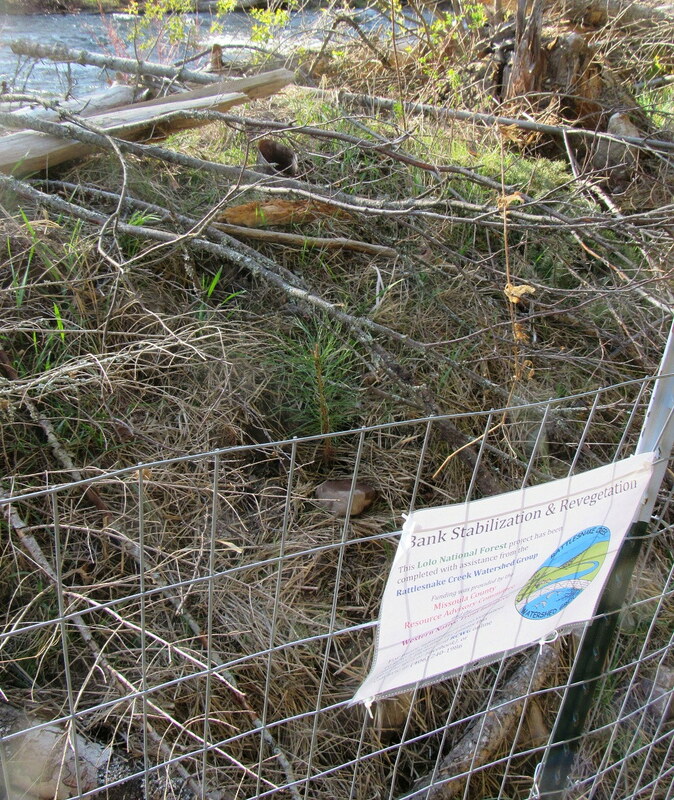 Send us an email and we’ll send you some more information–there are a couple dozen ponderosa seedlings and some of them are a little hard to find among the branches and downed trees that are providing extra cover on the site. The Lolo N.F. specialists will determine when it’s time to take down the fencing–it’ll probably stay up through this year.